A man has died in a car crash which police believe happened up to two hours before emergency services were called. 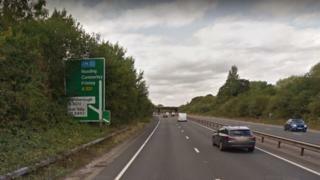 The 29-year-old was found dead in his vehicle, which had hit trees by the A331 near North Camp in Farnborough, in the early hours of the morning. Hampshire police appealed for anyone who saw the silver Peugeot 206 in the area between 22:20 BST on Tuesday and 00:20 on Wednesday to come forward. The road was shut northbound while officers investigated at the scene. The force said the man was from Tongham in Surrey and his next of kin have been informed.